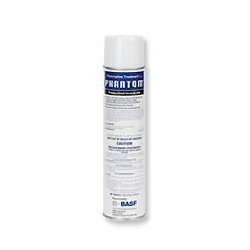 is The ONLY liquid nonrepellent, non-IGR labeled for indoor general pest control including commercial food handling areas! Pests are exposed to the active ingredient in Pressurized Phantom Insecticide either by ingestion or contact. Keeping Phantom HIGHLY effective even in high organic matter substrates and is not subject to rapid breakdown with detergents and cleansing agents like so many of the alternatives! Phantom Insecticide is effective even on pyrethroid-resistant strains of bed bugs and cockroaches making this your most powderful weapon in your fight with these tough opponents!